If you quarantine new, juvenile fish when you get them, especially Tanganyikans, it’s a good idea to not provide shells for cover. Even if you’re new fish are shell dwellers, hold off on the shells until they’re out of quarantine and you move the fish to your show tank. Why? Three reasons. First, many new fish are often shy and/or skittish, and will seek any kind of cover available to them. 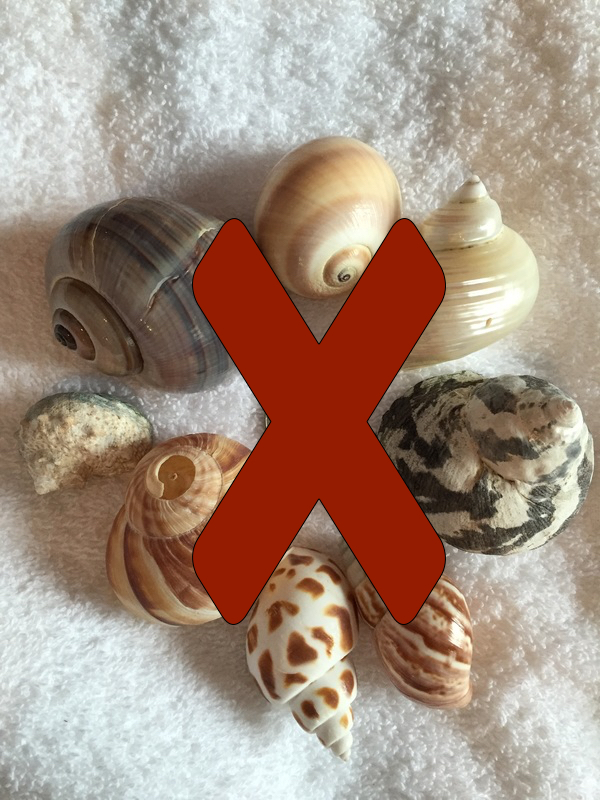 This includes shells, even if the species isn’t a shell dweller proper. 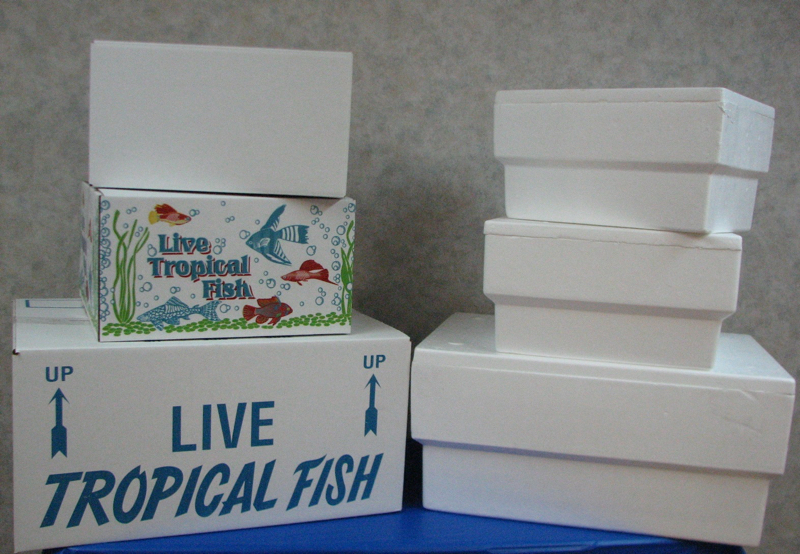 For example, juvenile L. calvus, L. compressiceps, and members of the Julidochromis genera have been known to utilize shells. Skittish or shy fish who aren’t accustomed to shells or who don’t use them by instinct may accidentally become lodged in them and be incapable of extracting themselves. If you’ve kept African cichlids long enough, you’ve invariably lost some fish that have gotten stuck in rocks. The same principle applies to shells. Second, shells provide a sick fish a place of refuge even if it’s not shy or skittish. It may just want to avoid all interaction with other tank inhabitants. This means a sick fish might well lodge itself in a shell and die there. Third, even juvenile fish may still be aggressive to each other, con-specifics or otherwise. Lacking any other option, the inside of a shell is a place of refuge from aggression. One thing you should be able to do frequently and easily if you quarantine your fish is account for them. Of all the fish you keep, quarantined fish are the ones you should be watching the most carefully so you can quickly recognize any signs of illness. You’ll want to address any signs of illness as quickly as possible. If you give quarantined fish places to hide such that there is no way you can see them, then you won’t be able to account for them and thus you’ll have no idea if they’re sick until it’s perhaps too late. Setting up a new cichlid tank is always exciting, especially when you get to pick up all new components for the tank AND the fish for it. The endless combinations available for filtration, lighting, heating, and water flow make the whole planning process fun. Furthermore, the unlimited decorating options just add to the creative possibilities. This is how it should be. However, don’t overlook tank maintenance in your planning process. What does that mean? Before you go planning to put 200 rocks in the 150g tank you’re in the process of setting up, remember you still have to clean the tank regularly. How do you plan to remove detritus and other waste from underneath those rocks? Sure, you can arrange a water movement system such that most waste gets “blown” to a certain part of the tank. Still yet, if you have a substrate of any kind, you’re going to have to move those rocks, wood, pots, pvc, decorations, and any other movable objects in order to vacuum underneath them. Waste WILL collect under such items. Planted tanks, especially those heavily planted, don’t present quite as many problems from the detritus that doesn’t get vacuumed up during cleaning. Therefore, this advice applies more to typical African set-ups where live plants aren’t a featured item. So make your maintenance routine part of your set up planning. The excitement of the tank turning out to look just how you envisioned it is awesome until that excitement is tempered by the realization that those 200 rocks make cleaning a nightmare. If you don’t mind spending a lot of time cleaning, then 200 rocks isn’t a problem. But if you want to minimize the maintenance effort while making the tank look how you want, decorate it to clean it. If you’re new to fish keeping, especially cichlids, don’t be fooled by all the photos you see of people’s tanks and filtration systems with lots of complicated looking equipment and plumbing. None of that is necessary to be a successful hobbyist. Nor do you need the latest and greatest equipment. I’m not disparaging those who utilize them. However, complex or even sophisticated equipment won’t make you any more successful keeping fish if success is measured by the quality of the environment that you maintain. You can have great water quality and be quite successful using very basic equipment. The hobby isn’t really that complicated, and newbies shouldn’t feel compelled to have complex set-ups to succeed. Most of the time, all you really need is a sponge filter and a heater. Much of what you should use depends on what you want to accomplish. It’s the same as buying a car. At the end of the day, every car will get you from point A to point B. If your only goal is transportation to and from, then don’t worry about the sophistication level of the car. Assuming you’re following the law, the exotic sports car won’t accomplish anything more than the baseline minivan or four door sedan. All of them will get you where you want to go. Sure, not all brands are equally reliable, efficient, comfortable, fun, etc. However, that’s a post for another day. It’s okay to keep it simple. 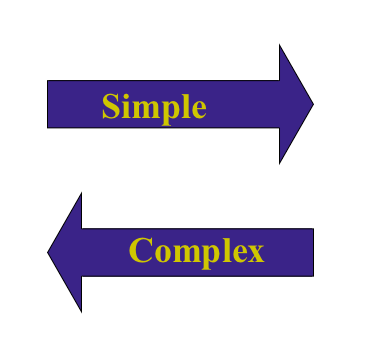 In fact, more often than not simple is better. Wrigglers with yolk sac attached to front glass. Photo by author. Note to self: Always check the ceramic tubes closely before removing them to vacuum the substrate. Yep, I did it. During my routine maintenance, I lifted a ceramic tube, turned it down toward the bottom of the tank to empty any fish out of it and, instead of adult fish, out comes a couple dozen wrigglers with yolk sacs attached. Ugh!! Of course they attempted to swim but were too small and too weighted. A few of them latched onto to the front glass of the tank but the rest spiraled down to the sand. And the sand is the same color they are. See the photo above (Pardon the poor image quality. My iPhone isn’t very good at macro photography). Unfortunately, my timing couldn’t have been worse. During all of my previous maintenance, I’ve never dumped wrigglers with yolk sacs. I’ve dumped some free swimmers before, but never at this stage. I decided against vacuuming the whole area where they ended up. I doubt they’ll make it, but I’m giving them a fighting chance. 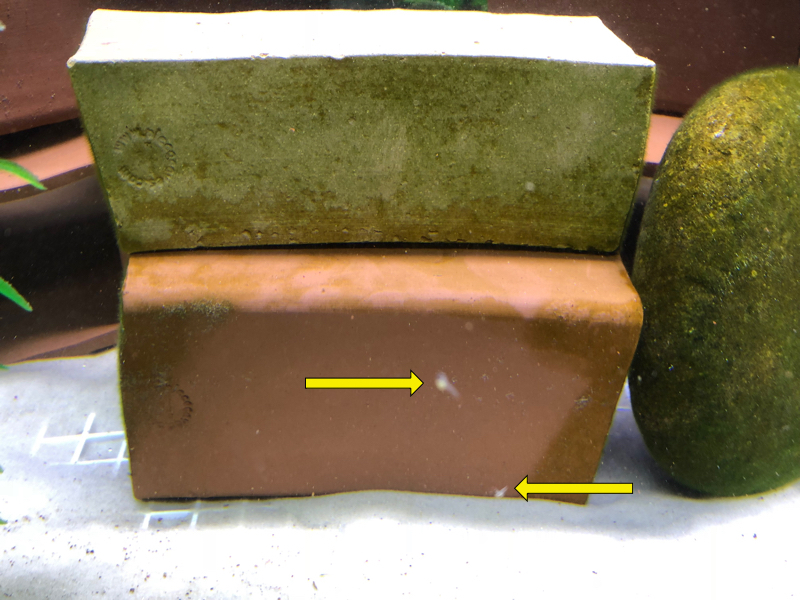 I have to say I was quite surprised because, if they were the brood of my Telmatochromis sp. “temporalis shell,” they were at the wrong end of the tank. It’s a 75g Tanganyikan community, but the breeding pair are always on the other end. It could be another species. Though I’ve never seen any fry, I do have a breeding pair of Julidichromis marlieri in the same tank, who tend to reside right where the wrigglers were. I also have a breeding pair of Neolamprologus tretocephalus and Altolamprologus calvus. I’ve never seen any fry from them either. Could any of those three spawned? Sure, but my money is on the temporalis; my pair are prolific breeders. Anyway, it’s always a good idea to inspect your tubes, caves, shells, and rock undersides before you remove them to the clean the tank. If you don’t, you might end up doing what I did and compromise a brood of offspring.